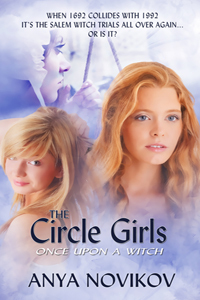 The Circle Girls: Once upon a Witch isn't your typical Christian young adult novel. What made you think to compare the Salem witch trials to a present-day bullying? As a long-time American Literature teacher, I saw firsthand how the Puritan unit resonated with teenagers. Just the term “Salem Witch Trials” invited them to pay attention. They soon learned the events of 1692 had little to do with the practice of witchcraft. Instead, scapegoating, jealousy, finger-pointing, blaming others for personal problems and mostly, bullying those who “didn’t fit in” caused the executions of 20 innocent people. To make the witch trials relevant for today, the students tied the historical events into life around us, for all the reasons mentioned above. Sadly, bullying and scapegoating will never leave civilization until people learn tolerance and personal responsibility. For many, it’s easier to point fingers and poke fun, particularly during awkward school years. Inventing a story with two parallel timelines became easy, not only because history repeats itself, but because I also believe everything changes even as it stays the same. Christians may be reluctant to read a book with the word "witch" in the title. Is there any witchcraft or glorification of witchcraft in your book? Indeed, the title and even the term “Salem Witch Trials” are provocative, but the message of The Circle Girls does not present “witchcraft” itself or glorify it in any way. Historically, until the age of reason and scientific discovery, people had no explanation for illness, failed crops, deformity, drought. Should a herd of cattle sicken and die, the idea of a dislikable neighbor casting a spell on the animals was believable. Adding to ingrained suspicions, the “new world” was a place of unexplored wilderness, wild animals, and other fearsome unknowns. The devil was certainly more active than usual in such a supernatural, dark environment, but mere innuendo could do a lot of damage, even without the presence of witchcraft or demonic activity. When a circle of proper Puritan girls accused friends or neighbors of witchcraft in 1692, nobody disbelieved their allegations. In the book, both modern-day Delli Willis and her 1692 counterpart Deliverance Wyllys are ardent Christians. What type of research did you do in order to bring authenticity to the historical portions of The Circle Girls: Once Upon a Witch? Salem captivated me from my first day in the classroom. I knew some day I’d find a way, a time, to write things down. And in the meantime, I never stopped researching or learning. (I firmly believe teachers who don’t learn more than they teach are just not good teachers.) The textbook’s teaching guides were a wonderful basis, but I found even more information in personal research. Sources are too numerous to list, but I was always on the look-out. I once found a children’s book at the grocery store that encapsulated the witch trials to perfection. A country lifestyle magazine I subscribed to featured pictures of the still-existing homestead of victim Rebecca Nurse. My students enjoyed everyday stuff like this. The Devil in Massachusetts by Marion L. Starkey was an invaluable resource, and I still love re-reading the copy I bought at the Salem Witch Museum—after checking out the local library’s copy around a thousand times. Her mention of 1692 gossip alleging a dark haired man seen emerging from a marsh at dusk helped inspire The Circle Girls’s swamp-man Gabriel. They both even wear dark trousers and blue shirts. One thing to note: The Circle Girls is set obliquely in the “present day” but the modern clique of girls live in 1992. Not only was that year the 300th anniversary of the witch trials, but the the modern story could then live without the ever-presence of today’s electronic devices, smartphones, social media, and apps. Delli herself even has to use an actual, old-fashioned encyclopedia to see if her own name appears on the historic list of witches. I sincerely thank my editors at Pelican Book Group for helping me make this slight step back in time, and for PBG’s endless support for my circle of girls. A Note from our editor: When Anya submitted this manuscript, it was at the height of bullying being in daily headlines. I was not only captivated by the story, but in the creative way the story meets bullying head-on and gives a voice to silent victims who may otherwise not realize their true worth. I'd like to share with you the Author's Note from back of the book. It says so much! Although I’ve used actual people and dates in my 1692 world, The Circle Girls is a work of fiction. This story is meant as an example of people’s reluctance to respect the differences of others. People often cast blame and bully those who are not quite like they are. The advice we are to take from the Gospels (Matthew 7:12; Luke 6:31) is simple: treat others the same way we want to be treated—with respect. If you are the unique-but-different victim, or one who doesn’t have the confidence—or the friendships Gabe has in the story—to resist bullying and taunts, please don’t suffer in silence. Talk to your parents, a favorite teacher, minister, a trusted neighbor; look for anti-bullying support on the Internet—find the comfort and aid to help you cope. I hope the message in The Circle Girls will help us each to remember that in the sight of God, every one of us is fearfully and wonderfully made. (Psalm 139:14). We’ve been created in the image of God, and He doesn’t make junk! Thanks for tackling such a difficult topic! Tanya, thanks kindly. It was a labor of love, for sure. I so appreciate your comment. What a terrific sounding book! Thank you for sharing about it. Thanks, Allison. I’ve been told it’s a meaningful for all ages despite the YA distinction. So I hope big people enjoy it too. Thanks for stopping by! I sincerely thank Ed-in-chief Nicola Martinez for this shout-out. This sounds like an important book for today’s world. With so much hate and violence around them, our young people need to read about how bullying and prejudice have affected us throughout history. We can hope they’ll learn from the past as well as the present. Look forward to reading your book! Hi Lucy, I agree. The Salem Witch Trials happened so long ago but actually the finger pointing goes on around us all the time. People seem so intent at blaming others for their problems. I so appreciate your commenting today. Thanks. Susan, thanks for commenting and for your kind words. So appreciate you. One of my favorite plays is “The Crucible” for all the reasons you are attracted to these events, Anya! The book looks like a wonderful story, and one with a deeply resonant message for teens and adults alike. Kady, thanks so much for stopping by. I loved The Crucible too although Miller combined characters and made Abigail Williams a lot older and seductive. But the message rocks. I hope all readers of The Circle Girls take away the message intl real life. Thanks again. That sounds really interesting! I teach high school lit, and I’ll be adding it to our booklist. Thanks so much, Bethany. Be still my heart. There’s a possibility of a study guide some day, but not firm on when. But I do think your students will enjoy it. Let me know! Wow! I am so happy to see this book…sounds like a good one for my preteen granddaughter! Pam, thanks as always, my friend, for your encouraging words. I can send her an autographed copy iff she’d like. Hugs. Your interview sounds like you handled a touchy subject well. I’m glad you did! Peggy, I feel blessed to have my story actually become a book. I hope readers find it and like it. Thanks for supporting me with your comment today. This sounds like a timely and amazing read for teens–and adults. Your cover says a lot through pictures. Hi Barbara, the cover is amazing, isn’t it? The characters look exactly as they should! Nicola Martinez designed it just the way it looked inside my head. I so appreciate your support. Thanks. This sounds so interesting and timely! Thanks for sharing. Robin, thank YOU for stopping by! It definitely is a theme for all ages and eras. Anya, our present teens are media saturated and need a magnet to pull them into literature. Your title and log line do that. We recently incorporated an anti-bullying course into training for camp counselors for a program I’m affiliated with. The counselors said it was one of the best trainings ever. I hope your book does well and impacts young lives. Marilyn, thanks so much for your kid words and good wishes. I can only hope and pray the book impacts people. I so appreciate you commenting today. Best of luck with the anti-bullying training…Prato g for positive impacts! Anya, this book sounds amazing! What a great “message,” and a wonderful way to capture the attention of teens, especially bullies and/or their victims. I believe adults will also be interested and benefit from reading The Circle Girls.” I certainly look forward to reading it! Thanks for the shout-out! This is honestly a book written with my whole heart.